The 2018 Chrysler Pacifica is a top pick when it comes to the minivan class. Whether you’re shuttling passengers, commuting to work, on a road trip, or just want a spacious vehicle to handle whatever life brings, Pacifica is the vehicle for you. Here are three features that appeal to any driver. 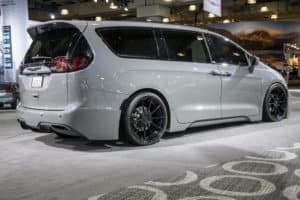 Minivans have the space to fit a lot of people, which is one reason why people choose to buy them. The Chrysler Pacifica is no exception. It seats up to seven or eight people depending on whether you want another seat in the second row with the captain’s chairs in the front row. It folds down into the floor for convenience when not in use, as do all the other seats in the vehicle, and with comfortable seating, it makes for a perfect long ride. Uconnect is available for both the driver and front passenger to interact with via an 8.4-inch touch screen display. It sits in the dashboard’s center and controls many of the Pacifica’s functions. This includes heating the front seats and steering wheel. Climate control is also accessible here, but it has its own dedicated button below, and, of course, it has radio and navigation control options, too. The 2018 Chrysler Pacifica doesn’t stop there. No matter who you’re driving, the dual 10.1-inch touch screens mounted on the back of the front seats provide endless entertainment possibilities. Bring DVDs or Blu-ray Discs for your own private screenings. The screens come with remotes, wireless headphones, built-in games, HDMI, and USB ports for maximum streaming and entertainment value. Stream video from an iPad or iPhone using a USB to lightning adapter or connect a PS4 via HDMI for on the road gaming. The driver assistance features on the 2018 Chrysler Pacifica are available at an additional cost. The package includes lane keep assist, which alerts you when the car is drifting out of the lane and tells you how to correct it. The collision avoidance system applies the brakes during a potential collision, like when another car unexpectedly pulls out in front of you. Standard rear park assist detects objects or people in your path and provides alerts to prevent you from backing into something or someone. The available parallel and perpendicular park assist system scans for parallel parking spots and controls your steering as you follow the on-screen directions to help you with the gear position. Gas and braking are the only things you need to control. Chrysler breaks the mold when it comes to making the Pacifica a minivan everyone can appreciate and enjoy. It has the space you need, along with modern tech and driver assistance features. Entertainment and technology are where the Pacifica stands out, thanks to Uconnect, touch screens, surround sound system, and other amenities. Stop by and test drive the 2018 Chrysler Pacifica today!